I think at some point in nearly every little girl’s life she dreams of life on the stage or in movies. Or at least, that is how it was when I was younger—before I realized I’m pretty shy, can’t dance, can’t carry a tune well enough, and can’t act to save my life. So maybe a movie career wasn’t exactly in the stars for me—but in a small way, I did achieve that dream of standing on a movie set. I had to pinch myself (multiple times) last year when I found out that myself and twenty-four other bloggers had been invited to visit the set of Captain America 2: Winter Soldier (out in theaters on April 4, 2014). I’d never been on a movie set before and had no idea what it would really be like; any ideas I had about it all came from books and, well, movies about movies. We were taken to a nondescript building—nothing fancy or decorative on the outside to even hint at the wonders of what we’d find inside. A few telltale signs included gentlemen riding around on golf carts; that went right along with my Hollywood version of life on a movie set. After signing a nondisclosure agreement (I’ve been keeping this set visit a secret for almost a year! ), we were ushered inside of the building and seated in a couple of rows of folding chairs. 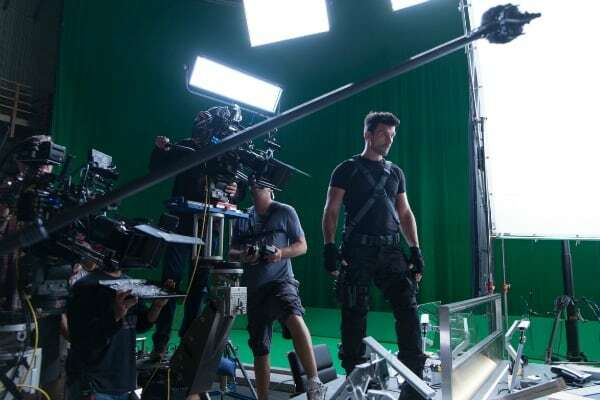 No more than fifty feet in front of us was the scene being filmed, with Chris Evans, Scarlett Johansson, and Frank Grillo having an intense conversation aboard an aircraft. Chris Evans and Scarlett Johansson have starred in a handful of movies together, and the friendship between the two that we observed that day was full of humor and respect. Easily the most hilarious moment of all was when I heard Chris say “Just call me Harvard Hottie” when the two were discussing how many movies they had been in together. Evans and Johansson played a romantic pair in 2007’s The Nanny Diaries, based on the novel of the same name written by Emma Mclaughlin and Nicola Kraus. My acting experience is limited to drama class in high school and the chorus in a couple musicals—what the stars in this scene had to do is nothing like what I had experienced for myself, where we would often just run through the entire thing once and call it a night. 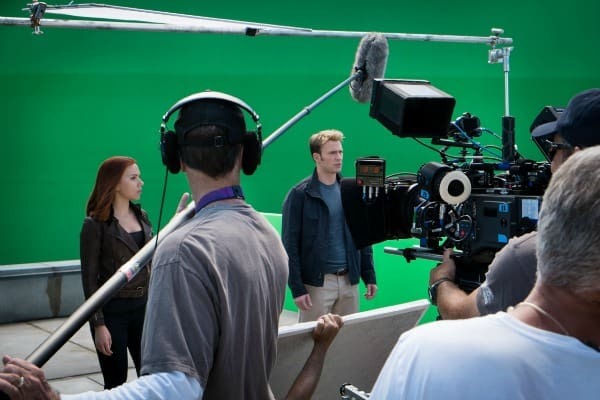 Chris, Scarlett, and Frank tirelessly got into position for each new take of the same exact scene. Thanks to headphones that we passed around our group, we were able to hear their lines, and any small mistakes they made. Overall, I found it impressive that each of them displayed so much passion for their work. It’s not an easy job, to be sure, and they spend hours on set each day, performing the same scene over and over. I was exhausted just watching them! When I didn’t have my eyeballs glued to the movie magic in front of us, I was glancing around the room, taking in everything else. In one corner, there was a food cart set up. Sitting in chairs around us were people I can only assume were minor characters from a scene they might film later, or body doubles for the main stars. 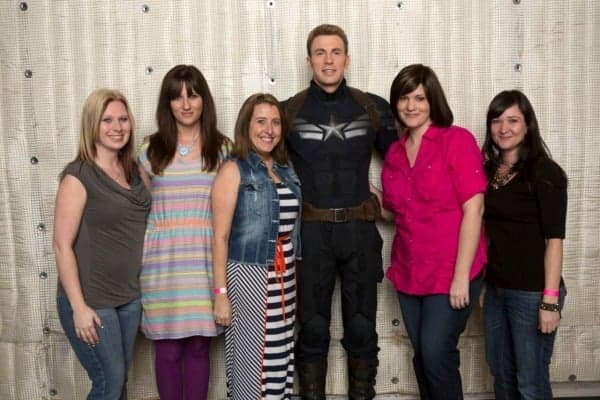 Finally, the big moment came when Chris Evans walked over to our group and began chatting with us. He shook each person’s hand, and introduced himself (“I’m Chris”). Just as I’d observed in his interactions with Scarlett, he displayed an easy-going nature and a charming sense of humor. Captain America was already my favorite Avenger before meeting Chris Evans himself, but that brief encounter solidified it for me! You can now pre-order your tickets for Captain America 2: The Winter Soldier through Fandango! I also just found out that the extended trailer that you can watch right now includes the very scene that we saw being filmed! Check it out below, and let us know if you are just as excited for this movie as we are! Mark your calendars for April 4, 2014. Chris Evans does seem like a friendly, easy-going guy. I’m glad you saw this when you met him. He recently did a bet with Chris Pine about going to the Children’s Hospital as Captain America. Great cause!